Continuing the theme of my last post, I show here part of a drinks menu from a restaurant in the vicinity of Grand Central Terminal – as midtown as it gets. It is near The Beer Bar, whose sign I showed yesterday (but not from that pioneering establishment, founded 1994. The Beer Bar now blends easily into New York’s beer scene but was a scenemaker in its day). Kona, the Hawaii-originated, nationally distributed brand from Craft Brew Alliance, makes an appearance. So do two beers from Sam Adams, Rebel IPA and Boston Lager. Two wits appear, both well-known, had it been me I’d have selected one of the two shown and a wit from the New York area. Stella, the new Bud, is front and centre as is Bud Light – a doughty survivor from the old days – but after that it’s big crafts again, plus Chimay White and Guinness. This type of list is typical around town but often with variations such as Lagunitas or Stone, or perhaps Barrier, the New York-area brewery whose profile increases every day. Even the average street bar often offers a salting of distinctive local or other craft brands. The posted list nonetheless is very acceptable with some fine beers, my only argument is there is no characterful porter or stout. Now if Guinness released its 5.3% extra stout currently on supermarket shelves as a draft, that would fix that as it is much tastier than regular Guinness. Of course a strong stout or porter from a New York state craft would be appreciated, too. This type of menu increasingly will characterize the big cities and finally smaller areas, with adjustments that take in local brands and big craft distributed in the area. Will it displace the diversity of a true local beer scene? Not at all. Brewpubs and beer bars specializing in great beer will ensure further choice. Considering the realities of business and distribution in many parts of the U.S., the menu shown is a reasonable working out of trends started in the 70s by Michael Jackson, the American Homebrewers Association, All About Beer magazine, Jim Koch, Ken Grossman, Fritz Maytag and many others. Ale Street News, the long-time “brewspaper” edited by Tony Forder, played its part and is still to be found in beer hangouts all over Manhattan. N.B. The term “chalice” for a characteristic Belgian beer glass, was originated by Michael Jackson. Poets are the unacknowledged legislators of the world. 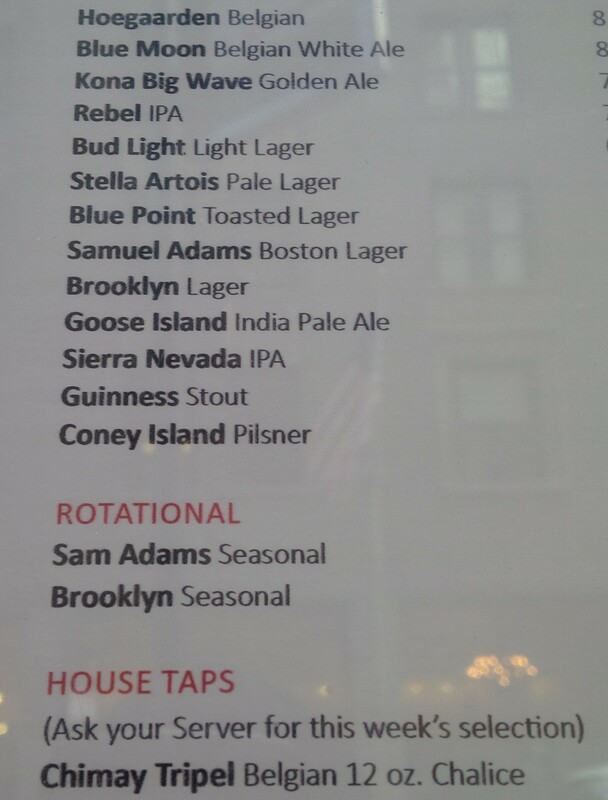 I was a bit surprised at the relative lack of local beer on this New York City menu, for crying out loud! I’d have been disappointed not only with the lack of style diversity but also with the dominance of corporate beer. You’re right Gary, our options are amazing these days and local beers should have a strong place on the beer menu regardless of locale. Sam, thanks as always for your thoughts. But we`re not really in agreement here. That list is from a “commercial“ restaurant. It`s not a beer specialty place. While it may seem somewhat conservative by the standards of 2016, it`s all relative. 10 years ago it would have been all Bud Light, Coors Light, Corona, Guinness, maybe Becks or Dos Equis. On that list you have some excellent lagers (all tasting different), wit beer, IPAs – and Bud Light which a lot of people still want. 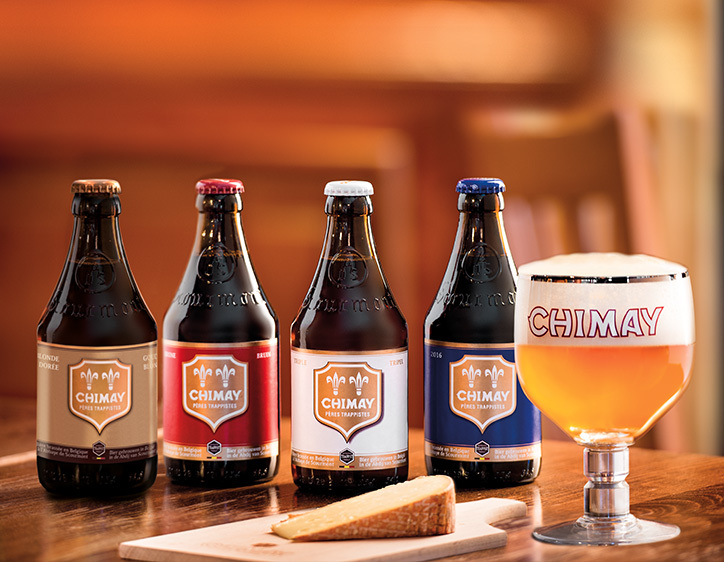 And a triple, Chimay from Belgium. Only in porter and stout is it a bit thin, but there are plenty of craft bars where it`s the same. I don`t accept the idea of corporate beer. It`s good beer or not, craft is a quality designation. Back in `78 when all this started, no one cared that Guinness or Courage, say, was very large. It`s the beer that mattered. Still does. This is why I don`t accept the idea of beer imperialism. Every product has its chance to be accepted, if some get more of a chance, that`s business. All the majors were small at one time, they learned how to grow, and I can`t gainsay that. By the way have you tried that Coney Island lager, it`s a genius recipe, best lager I`ve had in decades anywhere. I believe in time it will be the new Sam Adams Boston Lager. It reminded me of Tuborg in the 70s, and also a bit of Michelob back in the day except all-malt and more hops. Apparently it has rye in it, one of our favorite grains, eh. 🙂 I`d never have guessed that. When are you and Lew coming up here, we`re not getting any younger. Other than the fact that not all restaurants carry locally-made craft beers, we feel absolutely no need to ever drink anything not brewed locally. Just in the last few years so many brewers have sprung up that it’s amazing, and especially since we are not in a major metropolitan area. Good to hear Jan. You are in the northeast and that makes a difference too, but clearly the trend is deepening in the country.